. it have better noise immunity .the modulation stage consists of ic 555 timer working in astable mode and generating frequency shift keying (FSK)signal. As we know communication is the basic part of our life. Communication can be analog or digital. Now -a-days communication is mostly based on digital domain.In real, digital communication is very important aspect as it is mostly used in computers and many electronics communication. For digital data transmission, there are different modulation techniques such amplitude shift keying, frequency shift keying and phase shift keying, to achieve a better signal at reception. Frequency-shift keying (FSK) is a method of transmitting digital signals. The two binary states, logic 0 (low) and 1 (high), are each represented by an different frequency of pulse. Logic 0 is represented by a wave at a specific frequency, and logic 1 is represented by a wave at a different frequency. Basically, it is used in modem, point to point long distance communication. A modem a device which converts the binary data from a computer to FSK for transmission over telephone lines, cables, optical fiber, or wireless media. The modem also converts incoming FSK signals to digital low and high states (ie., logic 0 and logic 1), the language into which the computer can "understand". Today, a standard telephone modem operates at thousands of bits per second. Cable and wireless modems work at more than 1,000,000 bps (one megabit per second or 1 Mbps), and optical fiber modems function at many Mbps. A frequency shift keyed transmitter has its frequency shifted by the message. There are different types of FSK corresponding to the number of frequencies transmitted. 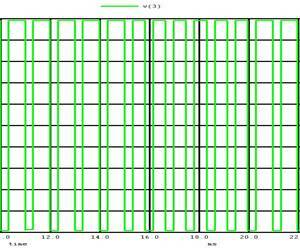 For example in QFSK we transmit four different frequencies which corresponds to the two data bits. Although there could be more than two frequencies involved in an FSK signal, in this experiment the message will be a binary bit stream, and so only two frequencies will be involved. Its working is basically similar to a multiplexer. When logic 1 is to be transmitted it switches to one frequency(consider it to be f1) and when logic 0 is to transmitted it switches to some other frequency(consider it to be f2).In this experiment we are changing the frequency using 555 timer ic. Ic 555 is used in astable mode. The 555 timer IC is has many applications. It is mainly used in a variety of timers, pulse generation, and oscillator applications.Ic 555 is timer can be used as monostable, astable and bistable mode of operation. Ic 555 is used in fsk generator. Basically, timer ic used in astable mode . An Astable Multivibrator is an oscillator circuit which continuously produces rectangular wave without using an external triggering. So Astable Multivibrator is also known as Free Running Multivibrator. 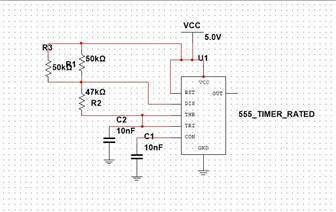 In monostable and bistable type of multivibrator we need an external triggering Astable Multivibrator using 555 Timer is very simple circuit, it can be implemented easily, very stable and low cost. Due to these reasons 555 has a large number of applications and it is a popular IC. In astable multivibrator the output changes according to the charging and discharging of the capacitor (which is at trigger pin). .therefore,Q'=0.this turns OFF the transistor Q1 and output of timer is high .since,Q1 is OFF ,capacitor C starts charging up towards +vcc though resistance Ra andRb . Capacitor is connected to threshold terminal and reference voltage of comparator-1 is 2/3 vcc,when voltage is equal to or greater than 2/3 vcc,the output of comparator1 goes high.this turns on transistor Q1 and output of timer goes low. 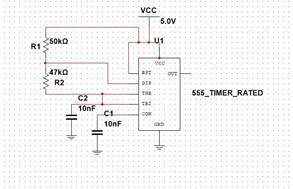 OFF and output of timer is high. Again, process is repeated. It consists of a IC 555Timer which works in Astable Mode. Here ,transistor pnp act as a switch.The resistors R1 and R2and capacitor C determines the Frequency of the FSK modulated signal. 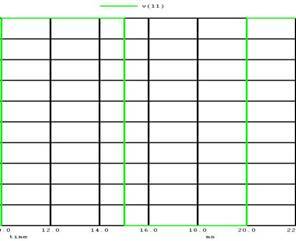 The standard digital data input frequency is usually 150Hz. When the input is HIGH i.e. when the input binary data is of logic 1, the PNP transistor Q is off and IC 555 Timer works in the astable mode of operation. 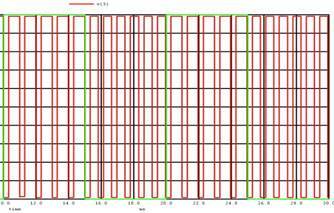 The frequency of the output FSK modulated signal is given by the Equation. The circuit diagram when the input is HIGH is shown in the Figure 5.
input is LOW is shown in the Figure 6.
bypass noise and ripples from the supply. 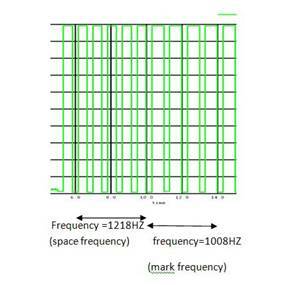 Mark frequency and space frequency are as shown in figure 7. The major disadvantage is its high bandwidth requirement compared to ASK. Therefore FSK is extensively used in low speed modems having bit rates below 1200 bits/sec. The FSK is not preferred for the high speed modems because as we know ,with increase in speed, the bit rate also increases.This increases the channel bandwidth required to transmit the FSK signal. As the telephone lines have a very low bandwidth, it is not possible to satisfy the bandwidth requirement of FSK at higher speed. Therefore FSK is preferred only for the low speed modems. communication systems such as amateur radio, caller ID and emergency broadcasts. Thus ,in project frequency shift keying using ic 555 is achieved. It having two frequency such as mark frequency(1008HZ) and space frequency(1218HZ).frequency shift keying is better than amplitude shift keying as it have a better noise immunity.